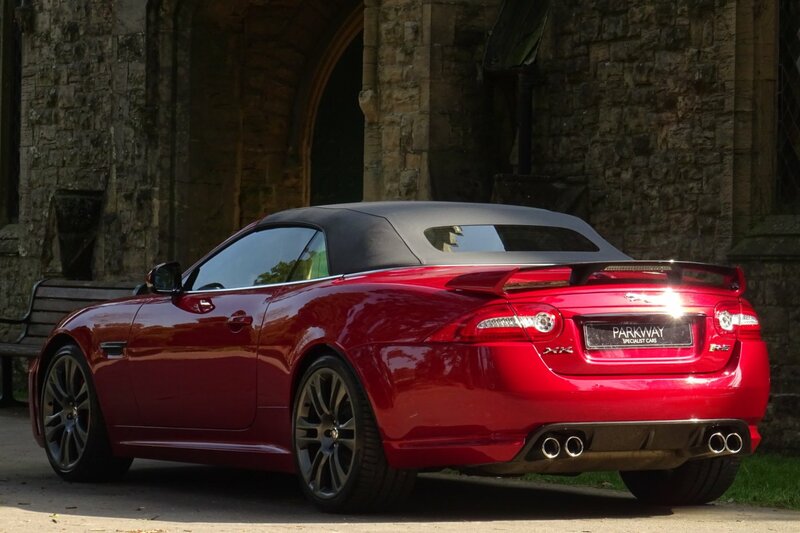 Making its debut at the Geneva Motor Show 2011 (with the convertible coming in 2012), the XKR-S is the most extreme expression yet of Jaguar's passion for building beautiful, fast cars. For the first time with a series production car, Jaguar gains entry to the exclusive '300km/h club' thanks to the effortless performance of the supercharged 5.0-litre AJ-V8 engine. 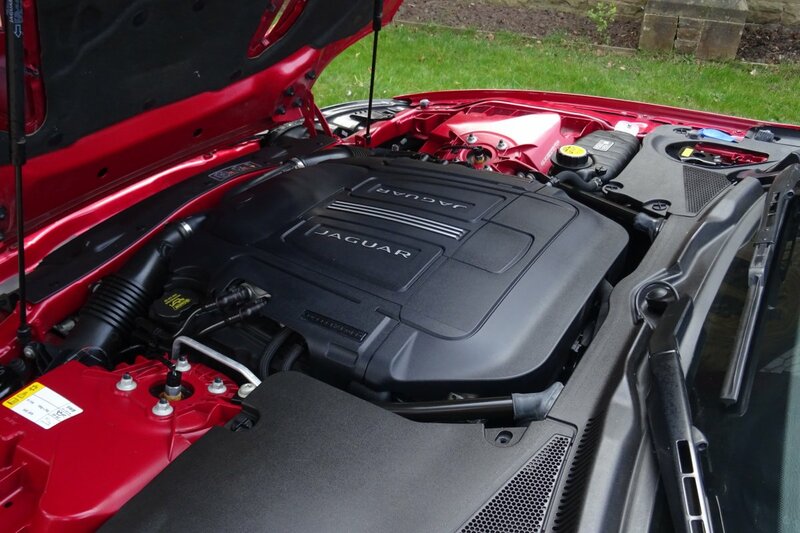 A revised fuelling map means the direct-injection powerplant now produces 550PS and 680Nm of torque. 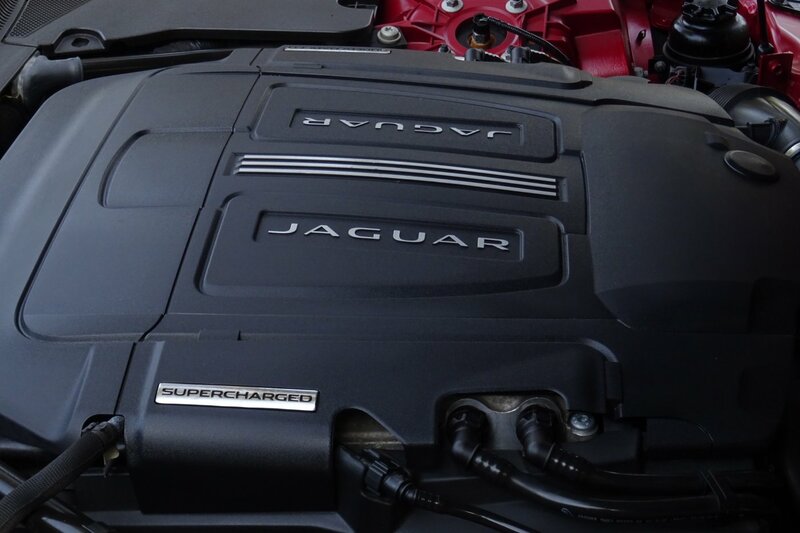 Extensive recalibration has ensured that power delivery and performance are seamless, contributing to a 0-60mph time of 4.2 seconds. 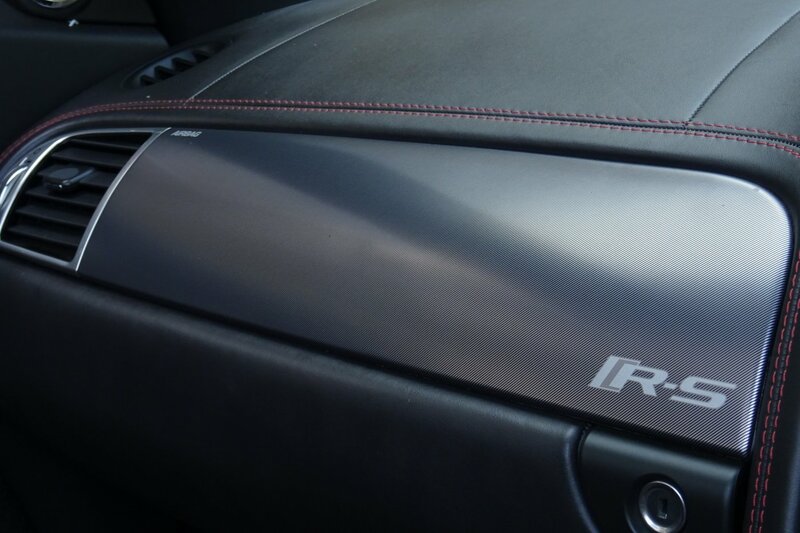 The Performance active exhaust encourages and rewards the enthusiastic driver with dramatic, motorsport-inspired aural feedback. 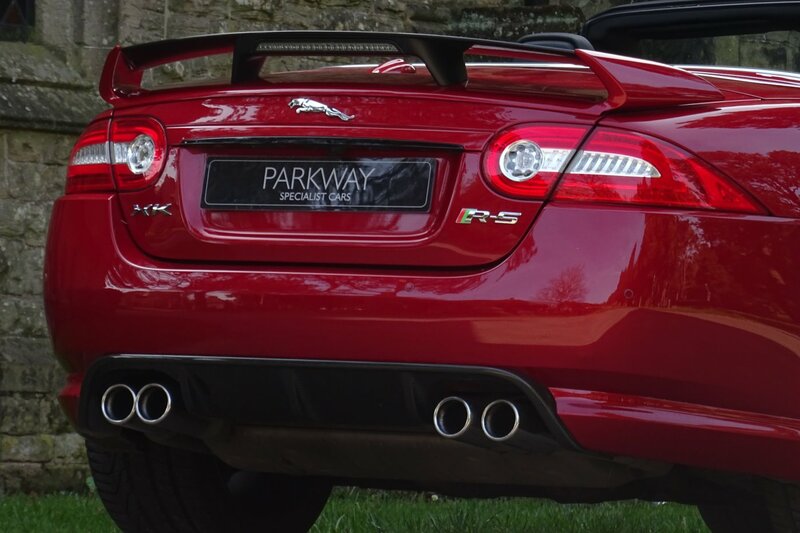 The XKR-S also required aerodynamic modifications to achieve its 300km/h top speed in the unruffled manner expected of a Jaguar and has been designed solely with an eye for purity of line and singularity of purpose. 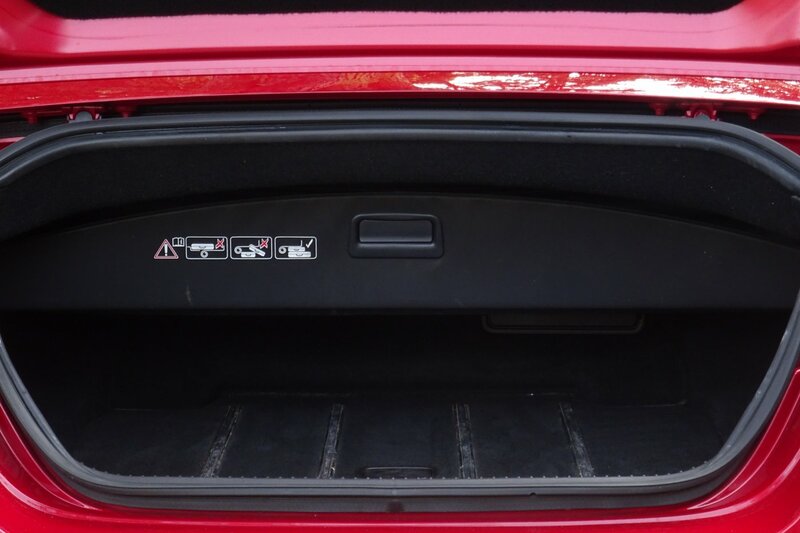 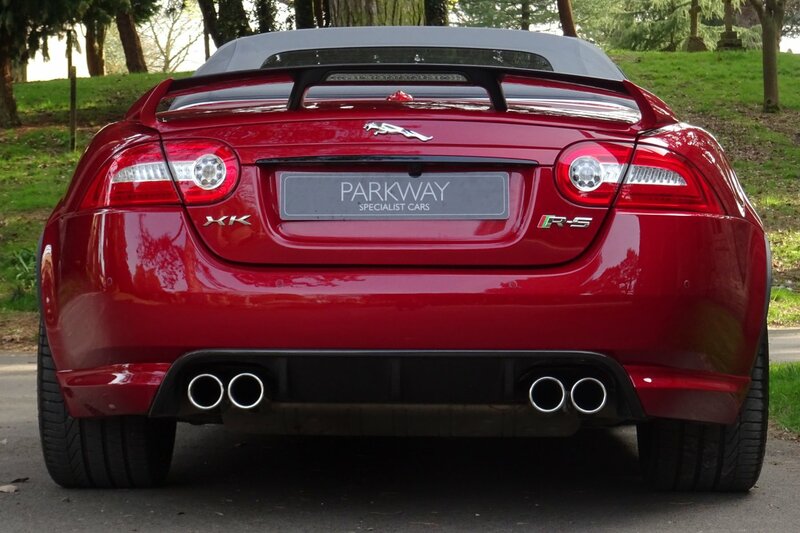 As the XKR-S approaches its top speed, there is a requirement to channel air cleanly over, around and under the car in order to maintain stability and ensure balanced downforce front and rear. 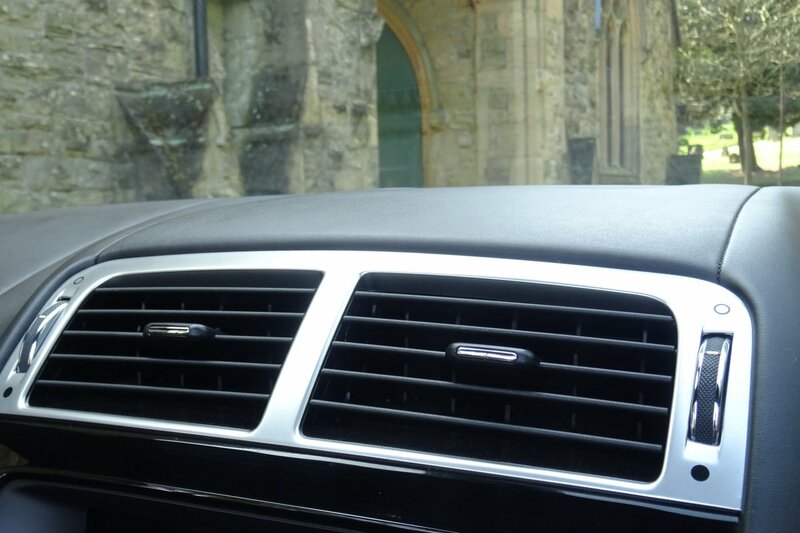 An overall reduction in lift of 26 per cent has been achieved. 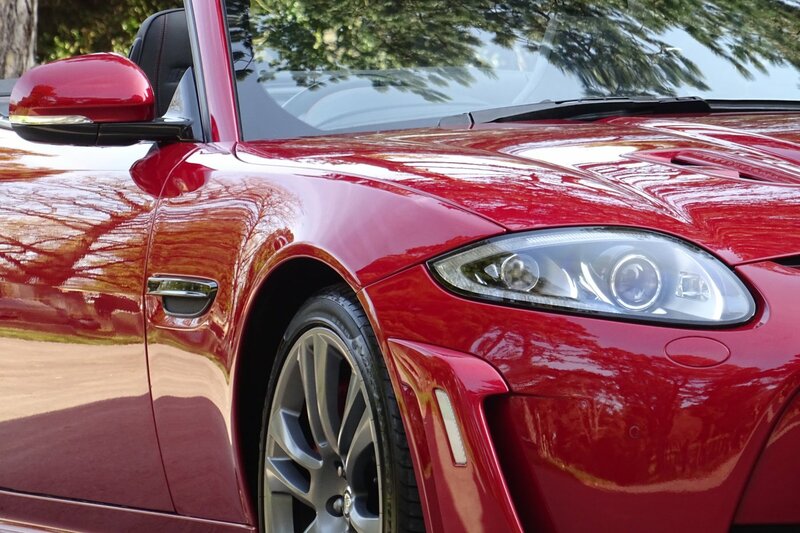 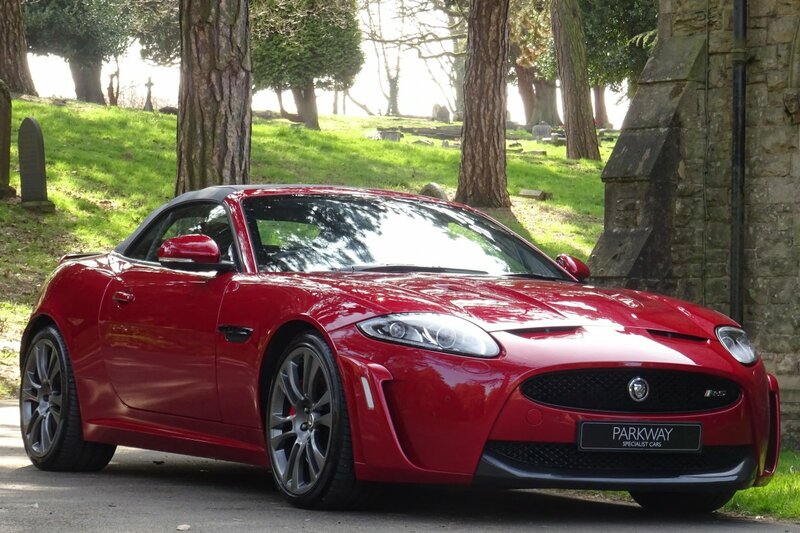 The first Jaguar designed entirely under the aegis of Design Director Ian Callum, the XK has received awards worldwide for its elegant appearance. 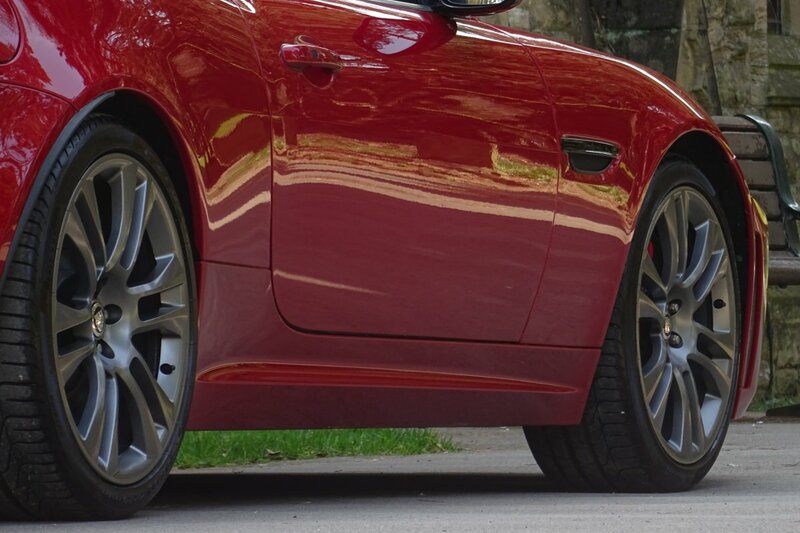 Now further styling changes keep the XKR-S at the forefront of modern sports car design. 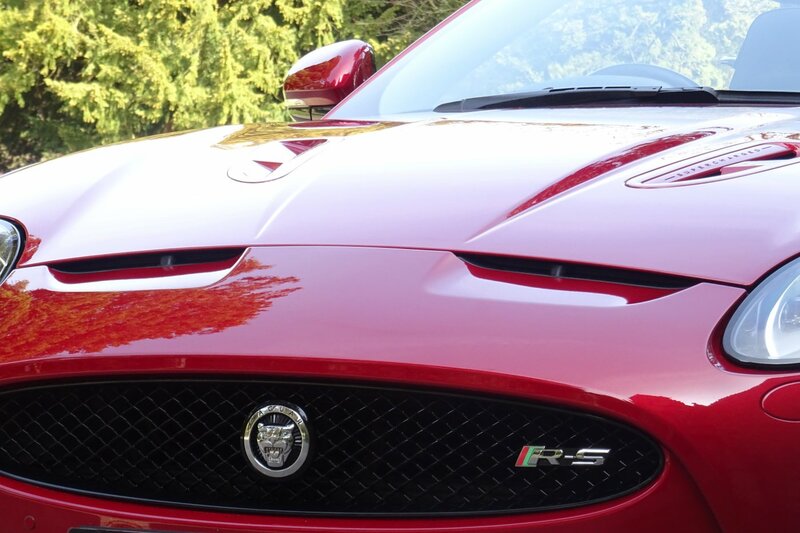 Slimmer, LED headlights, a more compact main air intake and vertical side power vent all contribute to a more purposeful front-end appearance. 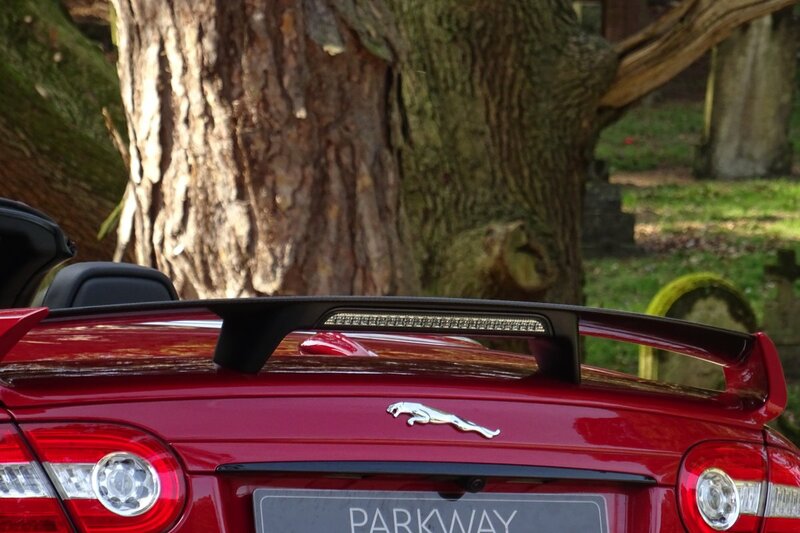 At the rear of the car the famous Jaguar 'Leaper' now takes pride of place in the centre of the bootlid. 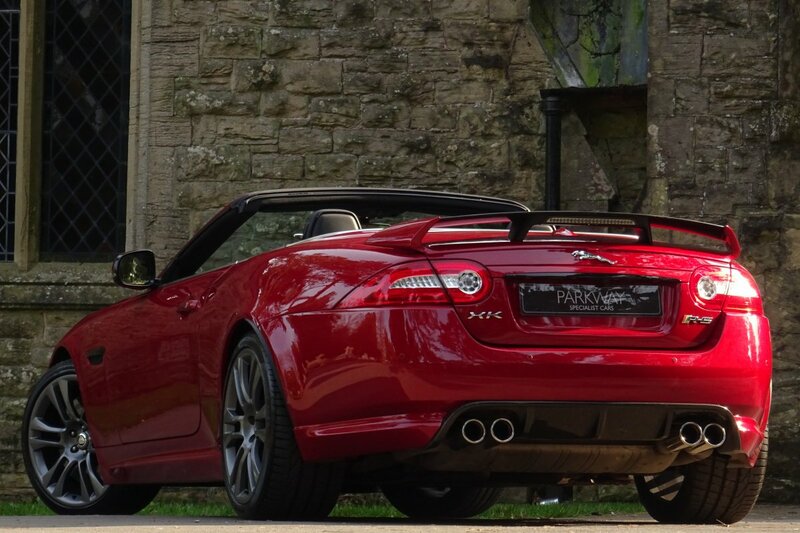 The necessary revisions were made after extensive Computational Fluid Dynamics work, proven through wind tunnel testing and are unique to this flagship of the XK range. 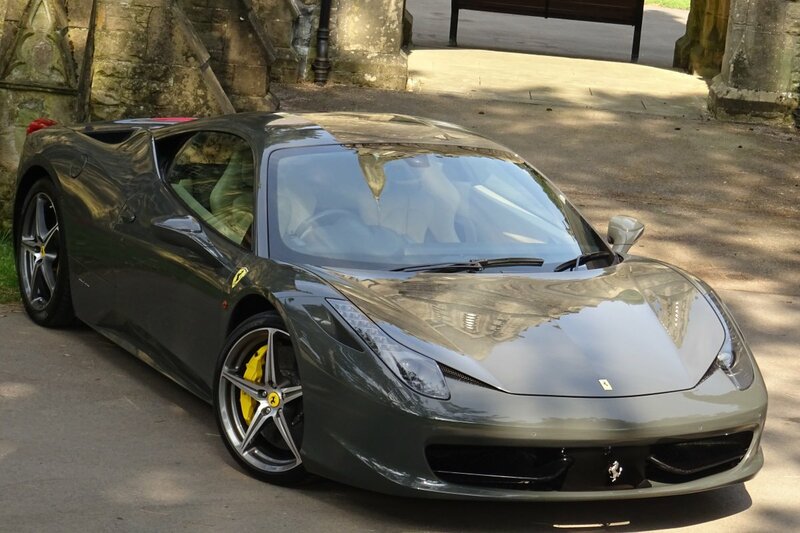 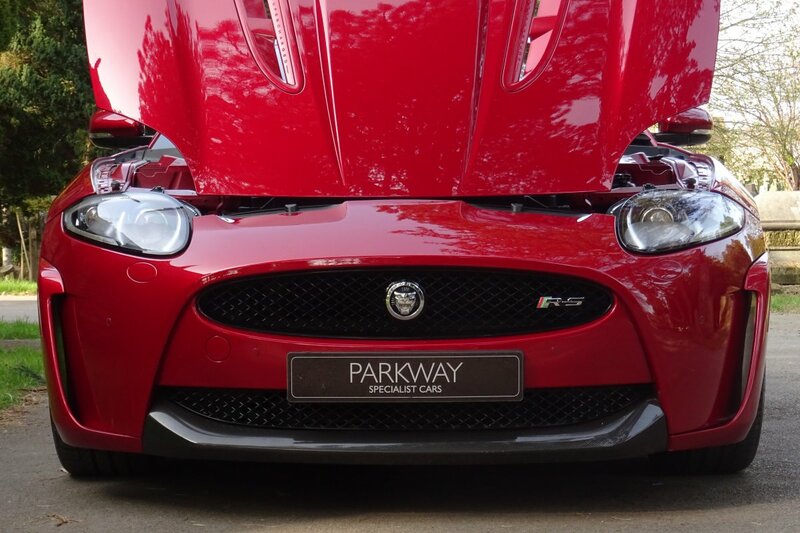 The most dramatic changes have been applied to the front of the car, radically altering its appearance and lending it a more assertive look. 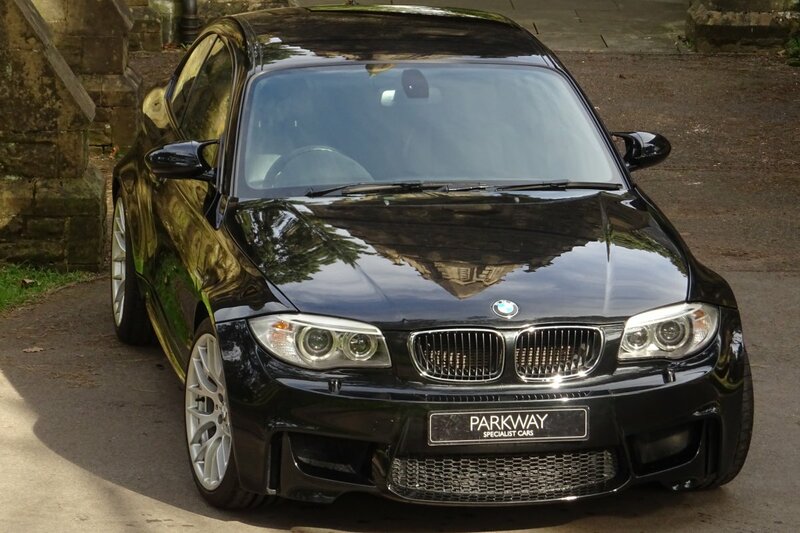 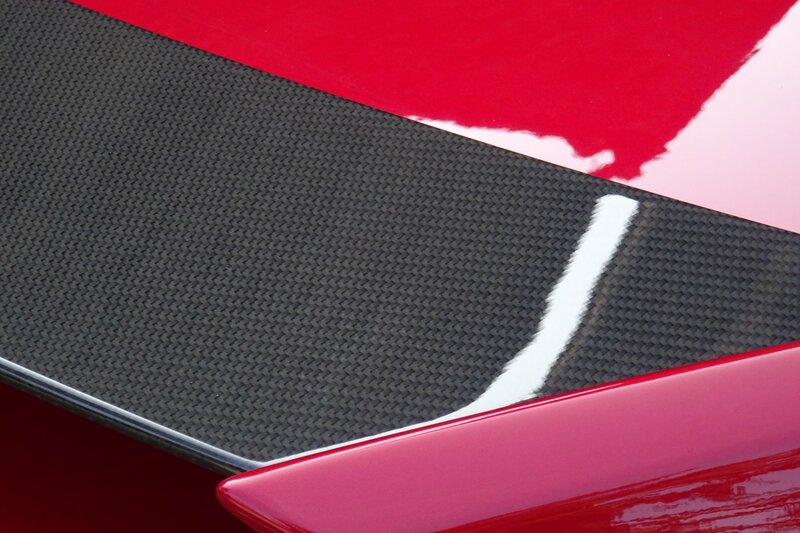 A new bumper design incorporates near vertical feature lines running down from the edges of the oval air intake and supporting the new carbon-fibre splitter and lower spoiler. 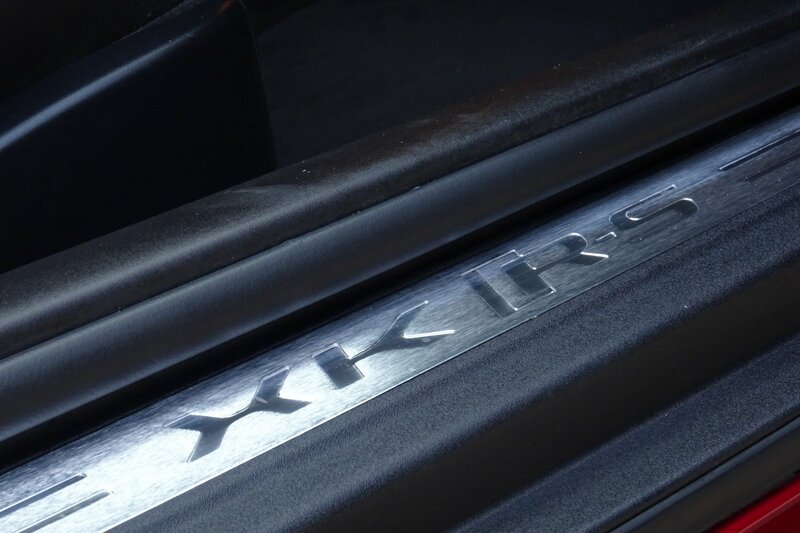 At the extreme edges of the front fenders, vertical slots channel air down the sides of the car and along the wider sills for increased high-speed directional stability.nIn order to balance front and rear lift, the XKR-S features a separate rear wing, a first for the XK range. 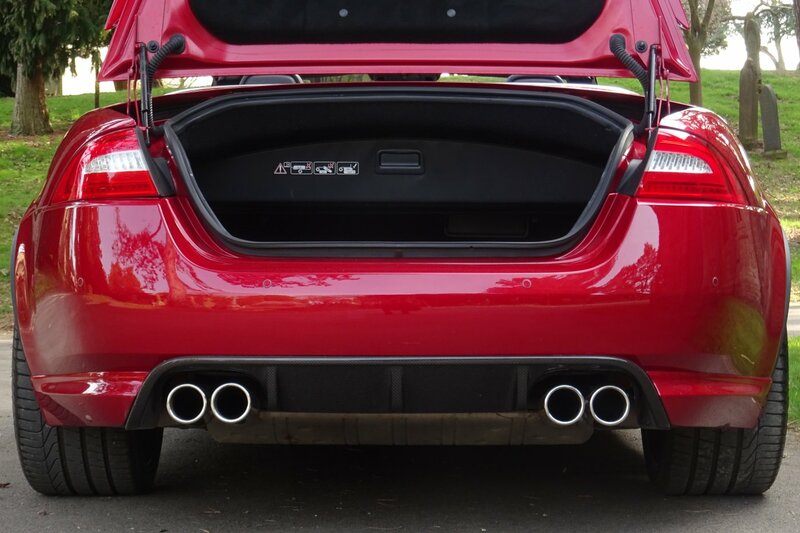 This addition, with its carbon-fibre centre section, works in concert with the similarly constructed Venturi structure underneath the rear bumper. 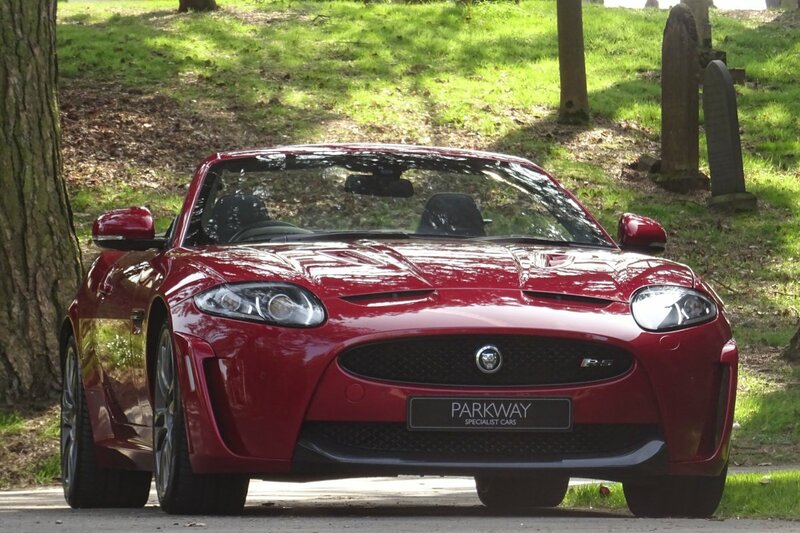 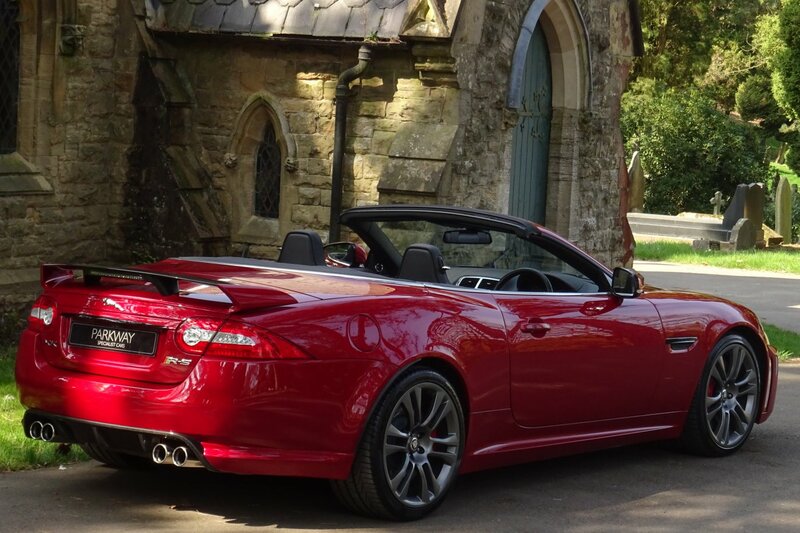 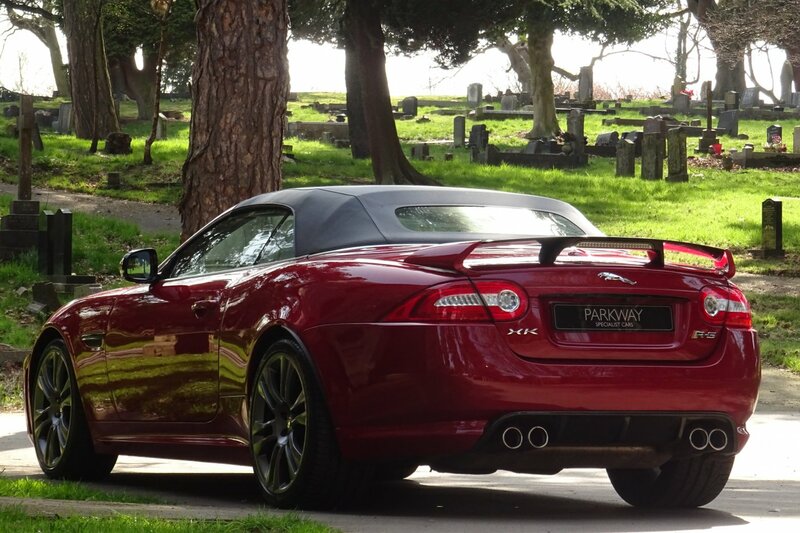 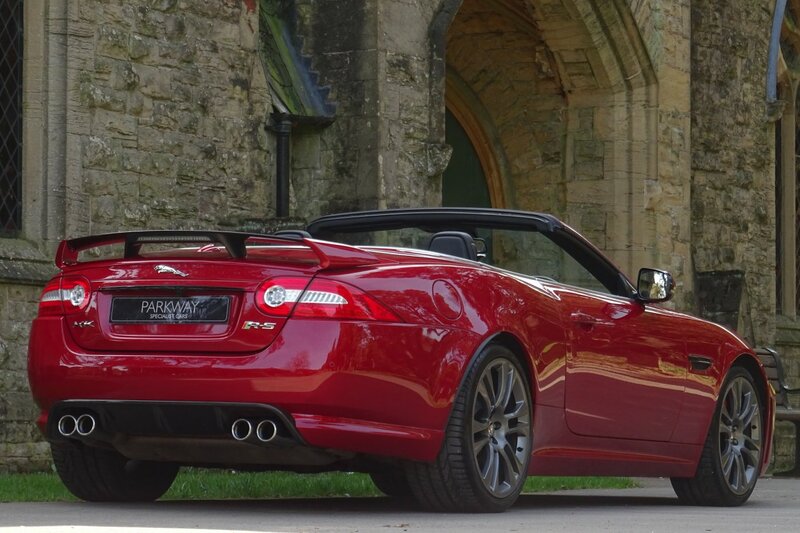 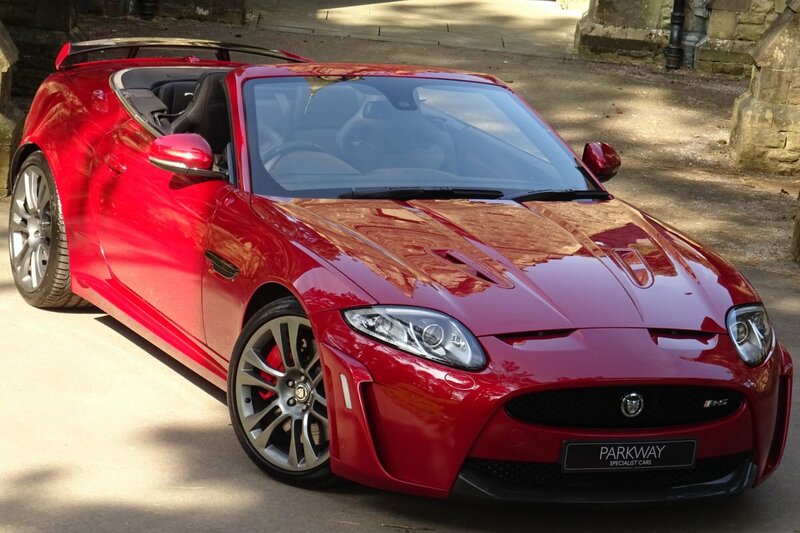 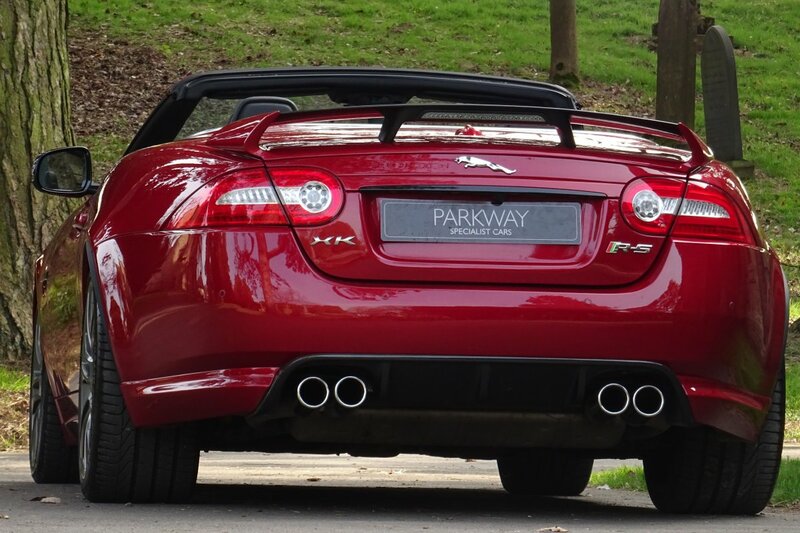 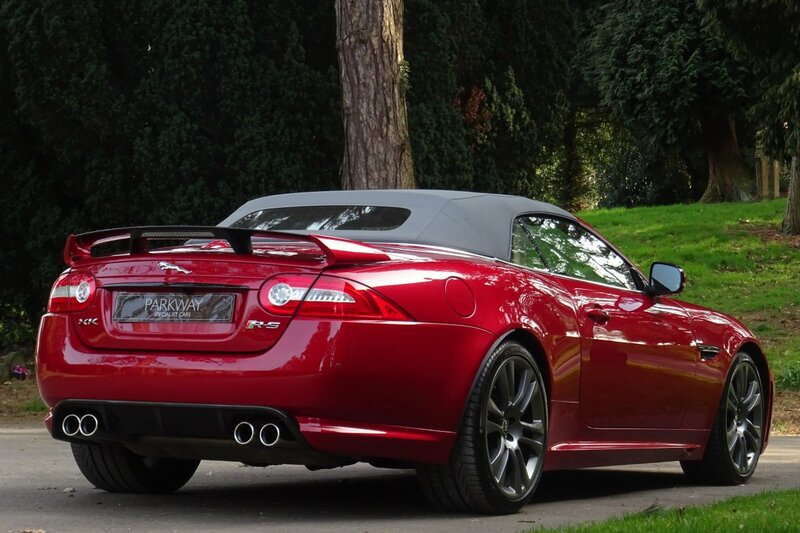 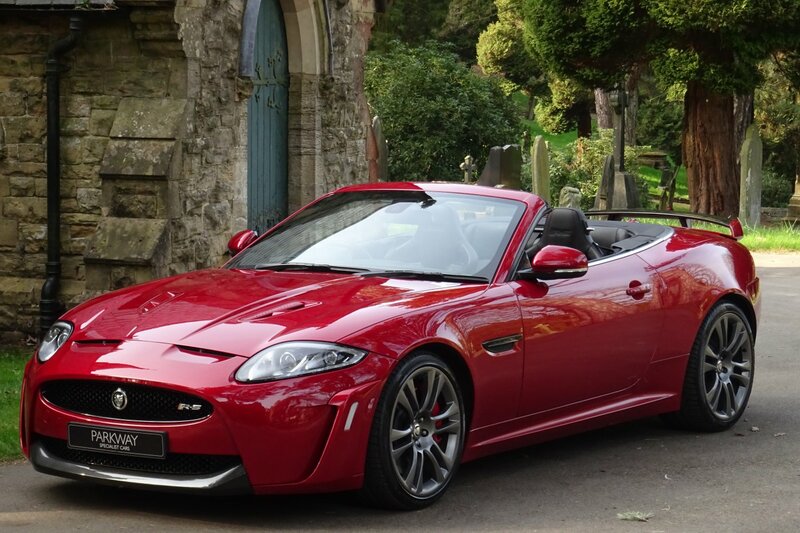 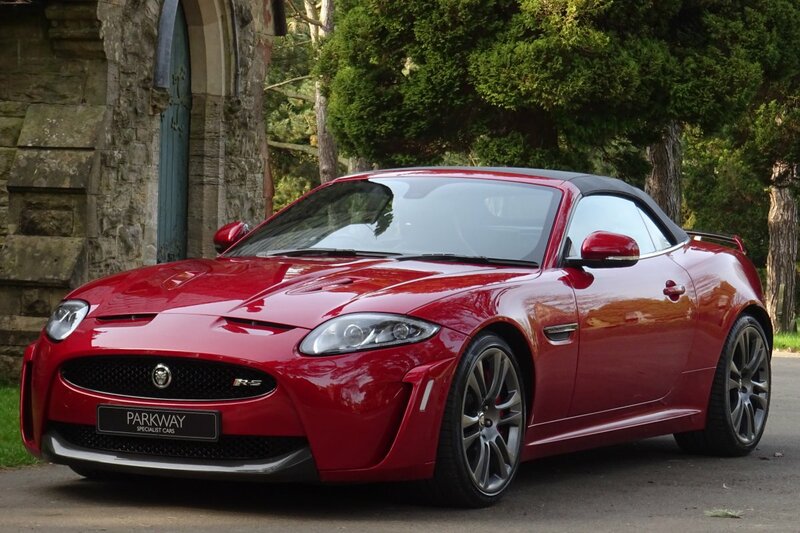 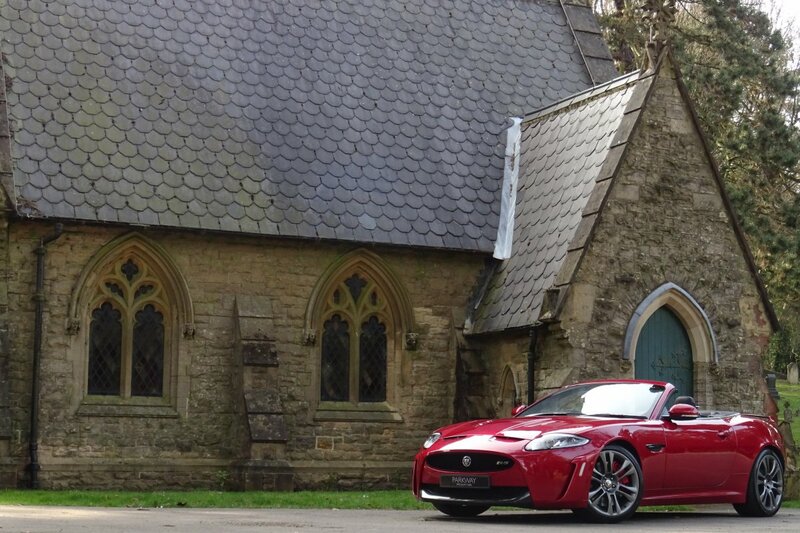 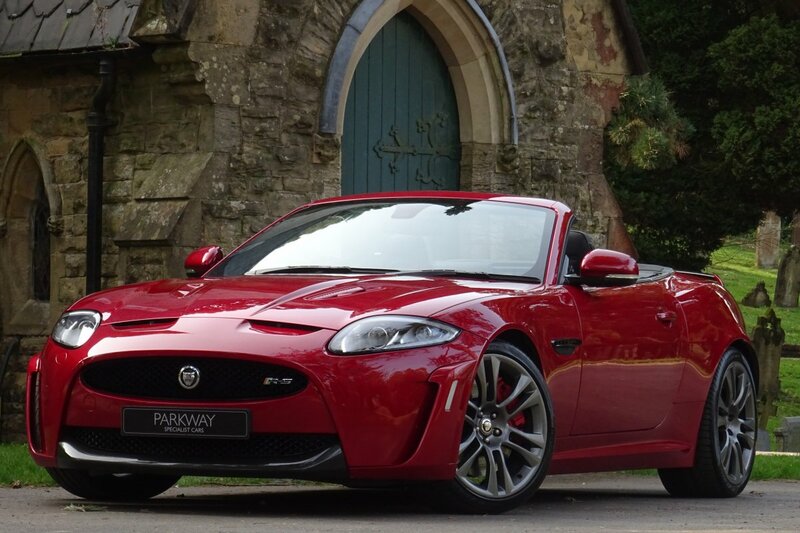 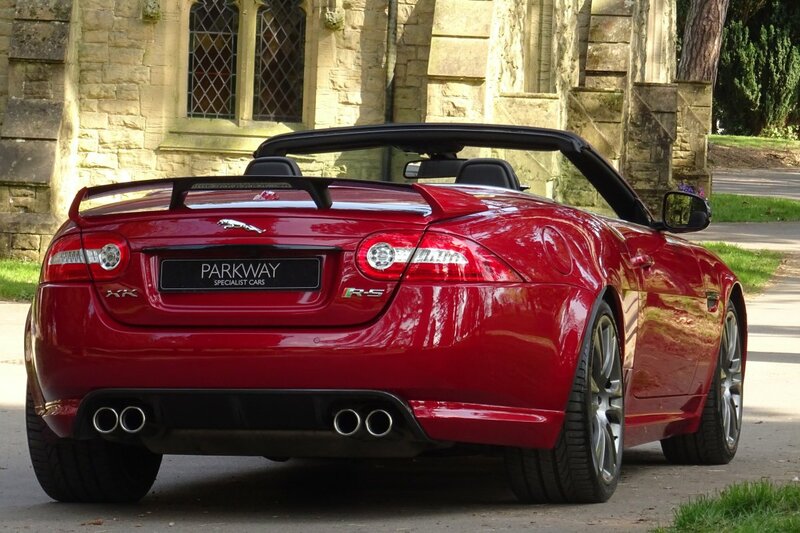 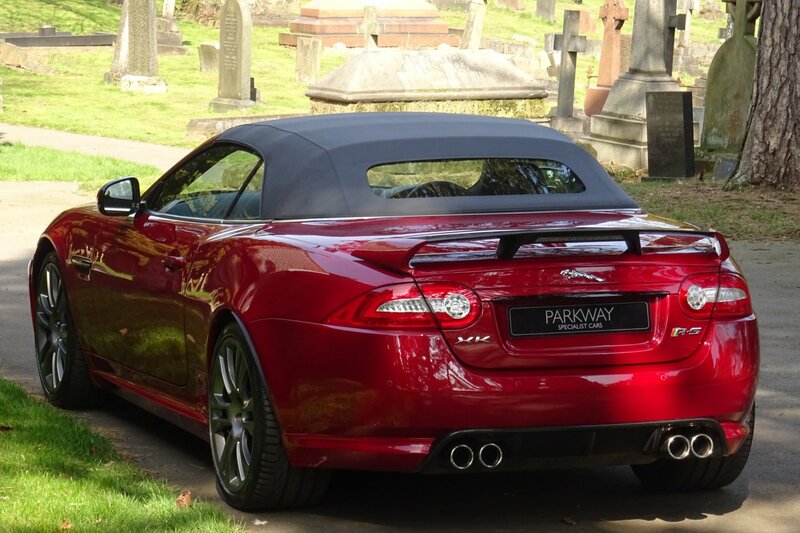 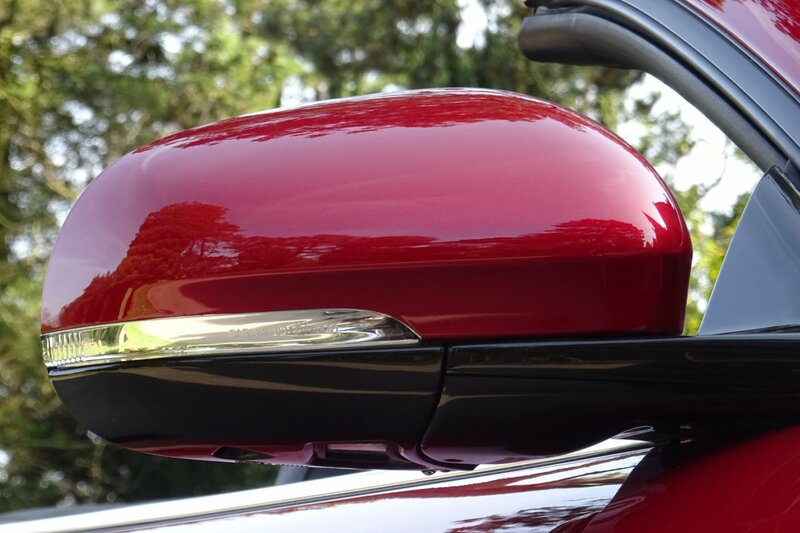 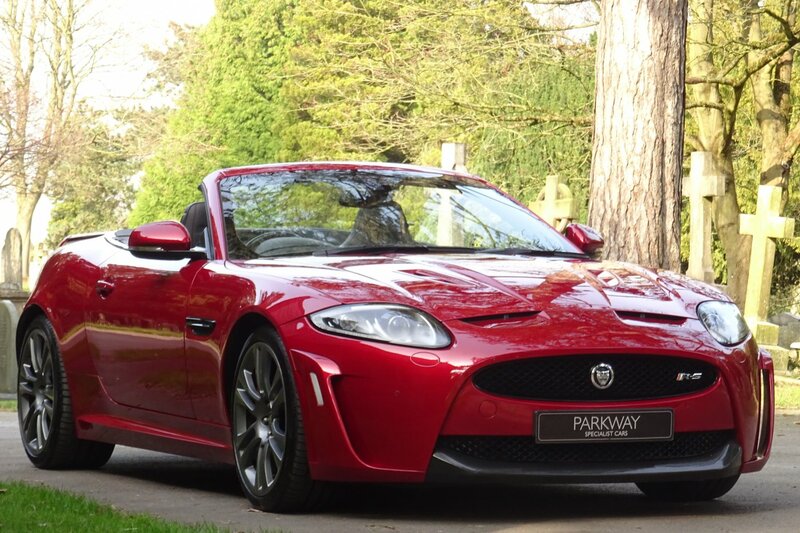 Our stunning XKR-S Convertible has covered just 14604 miles since first being supplied in March 2013. 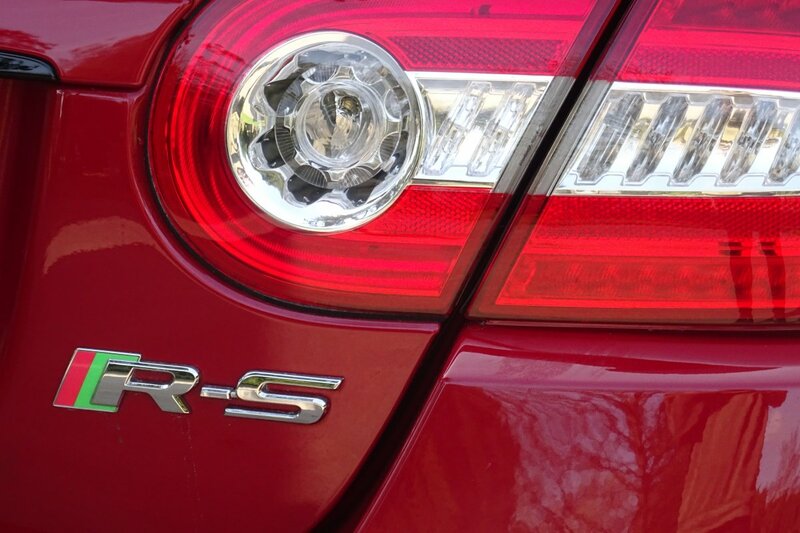 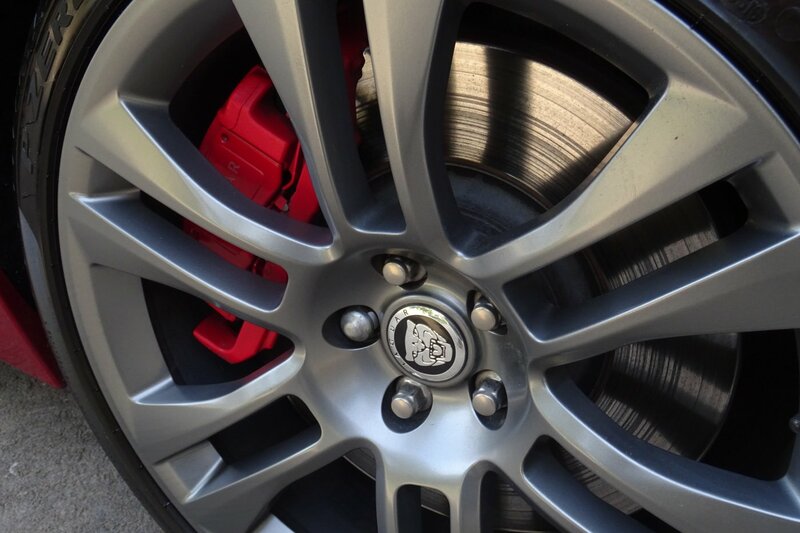 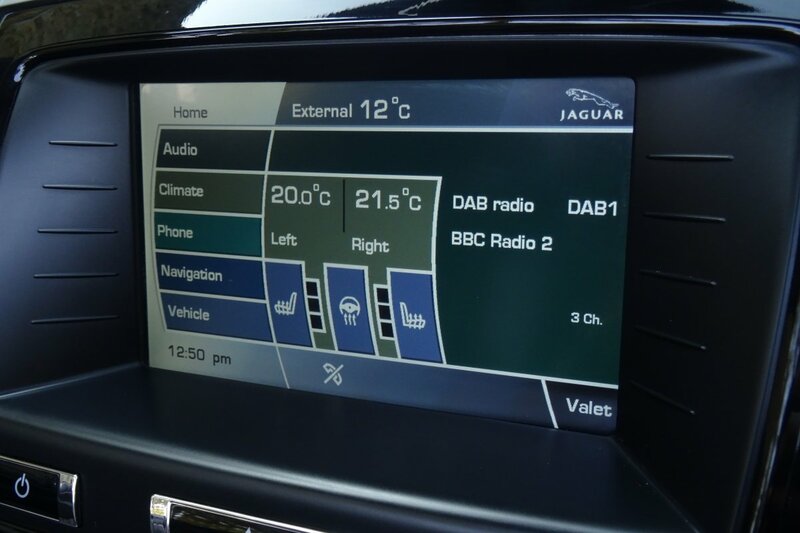 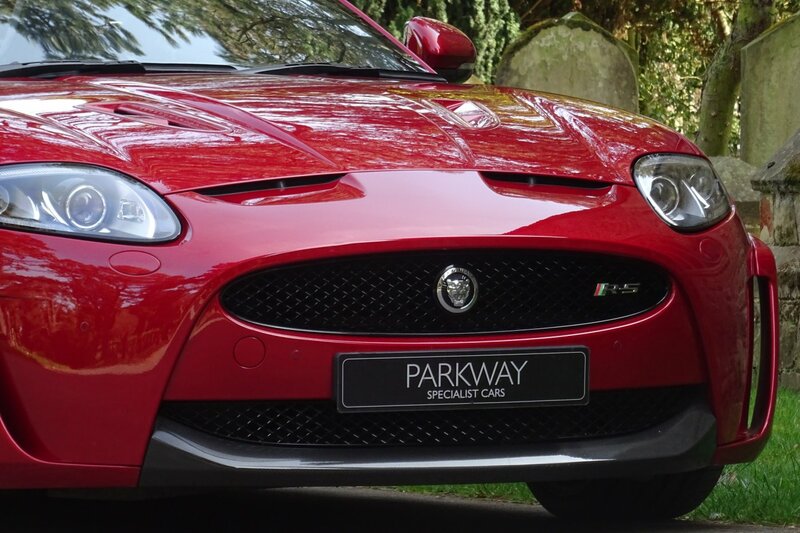 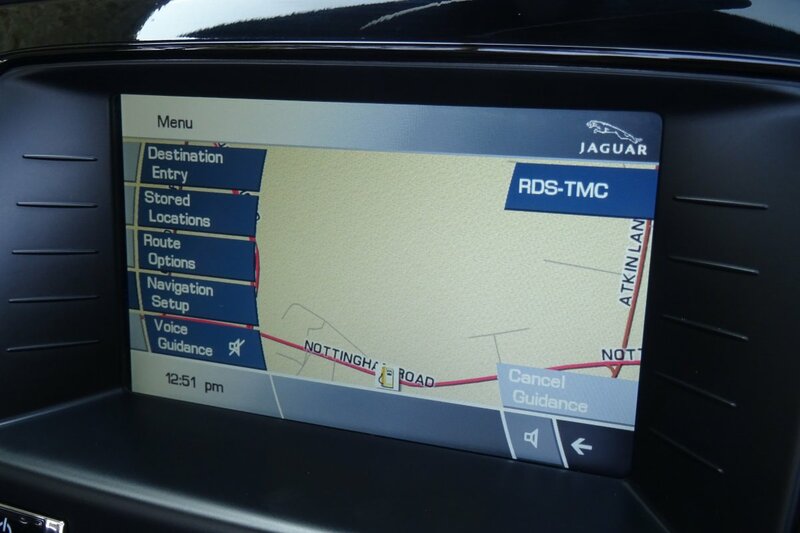 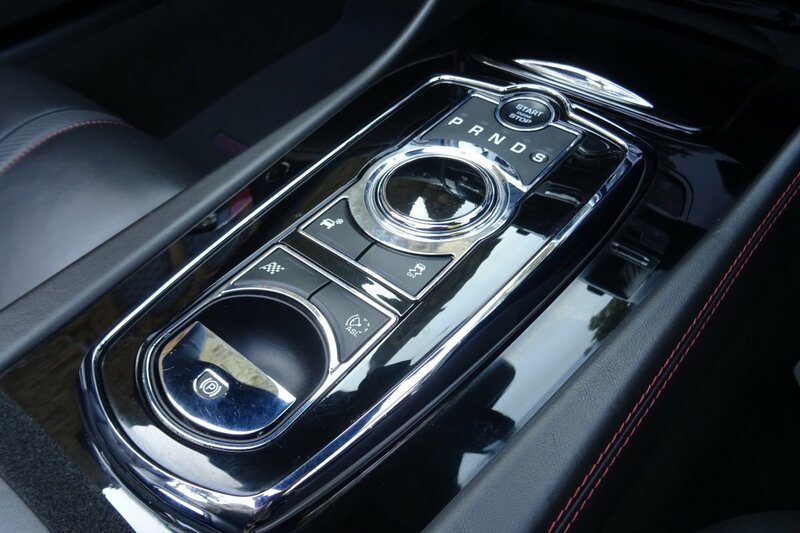 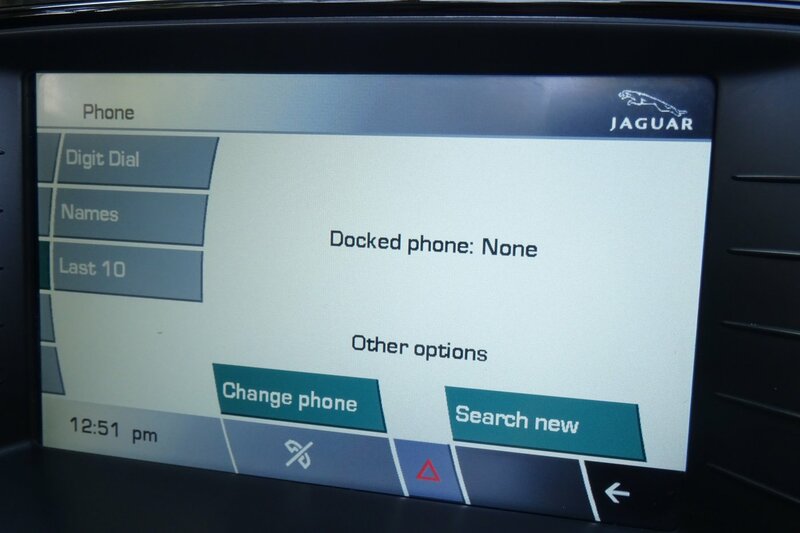 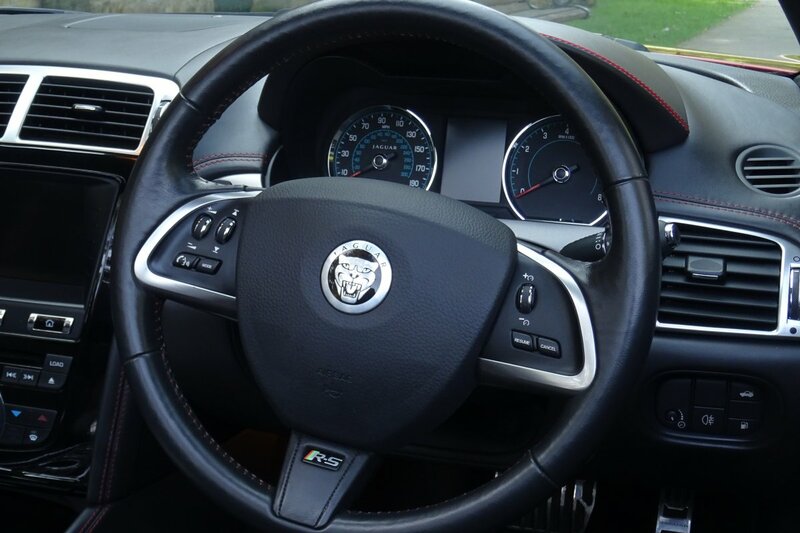 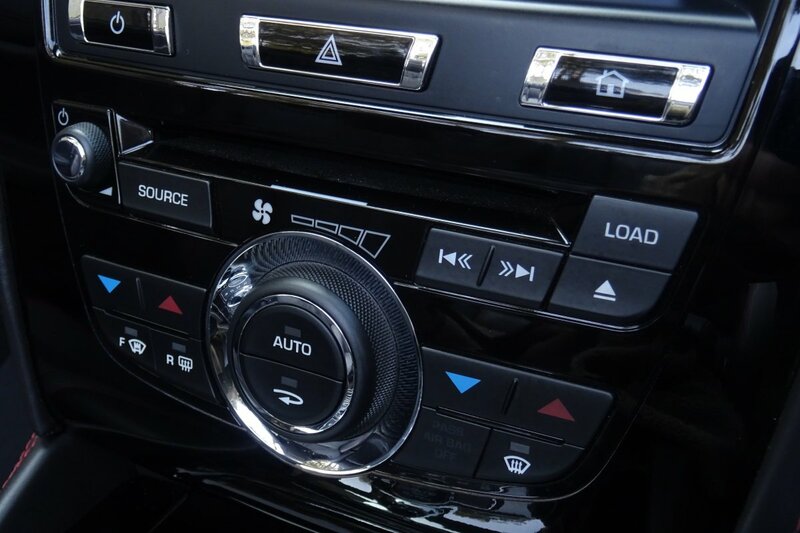 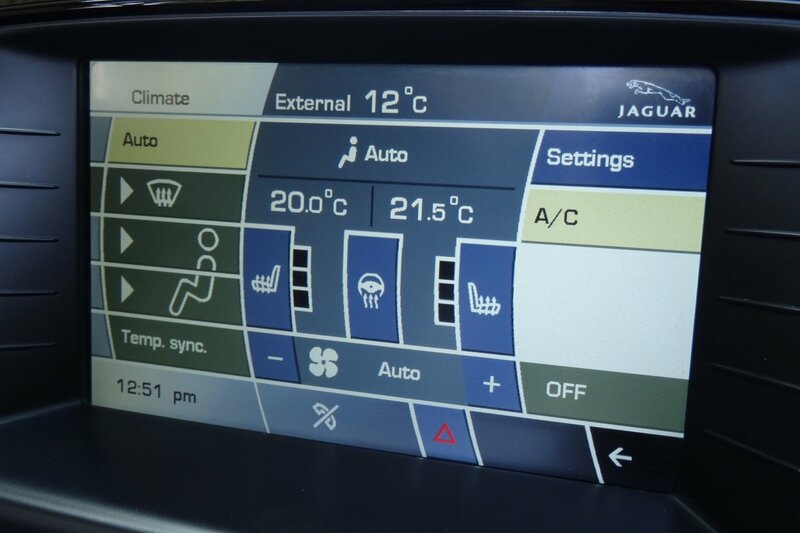 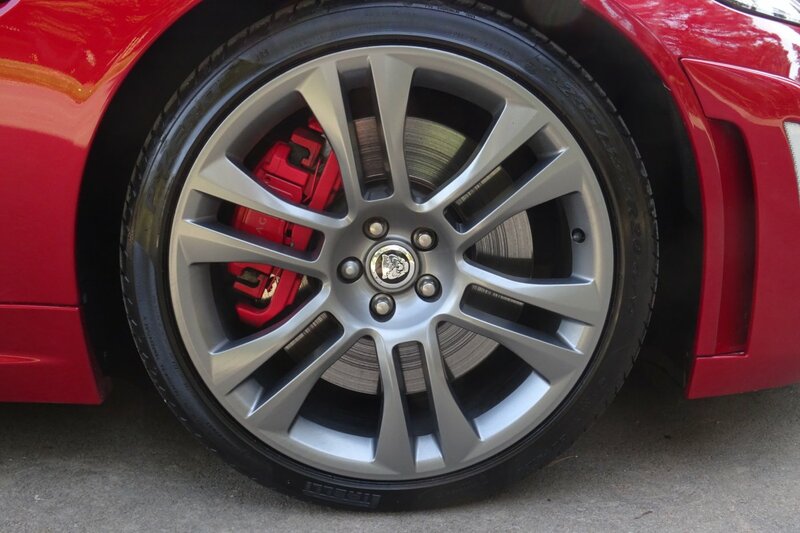 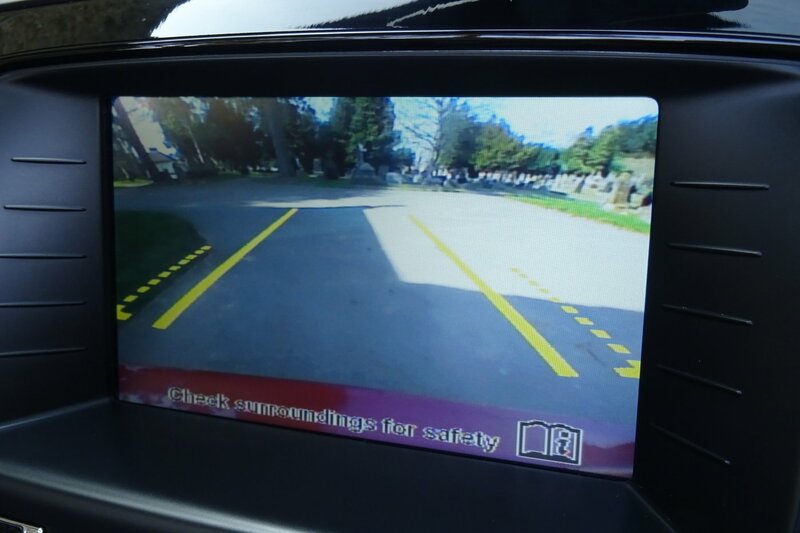 Since this date our car has been maintained to the highest of standards with Jaguar Service Stamps at 4787, 8533, 13205 and most recently in February 2019 at 14392 miles ensuring the car is ready for its next owner to enjoy. 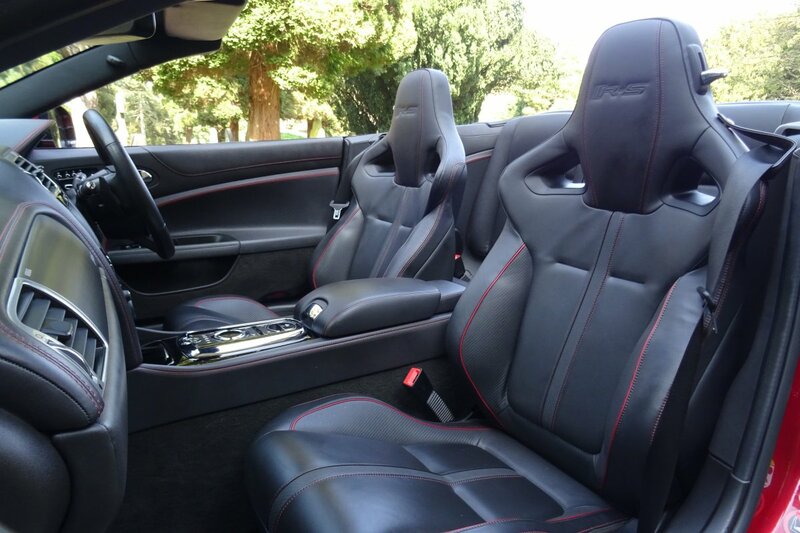 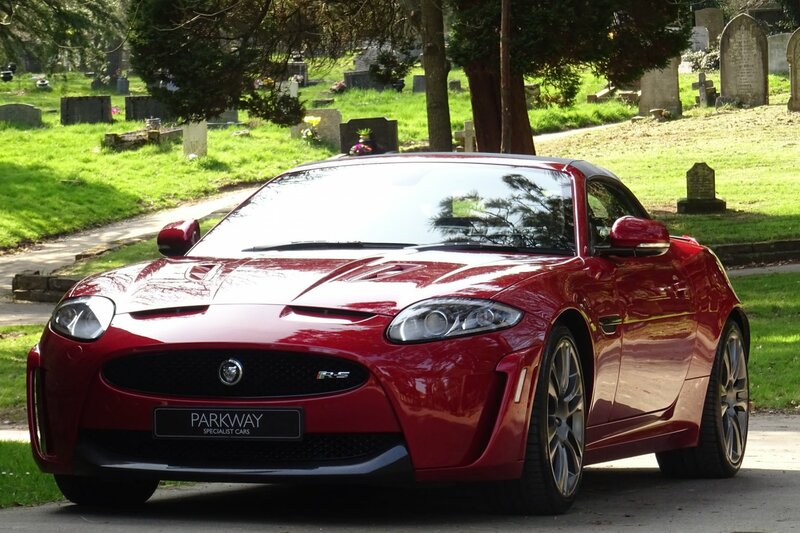 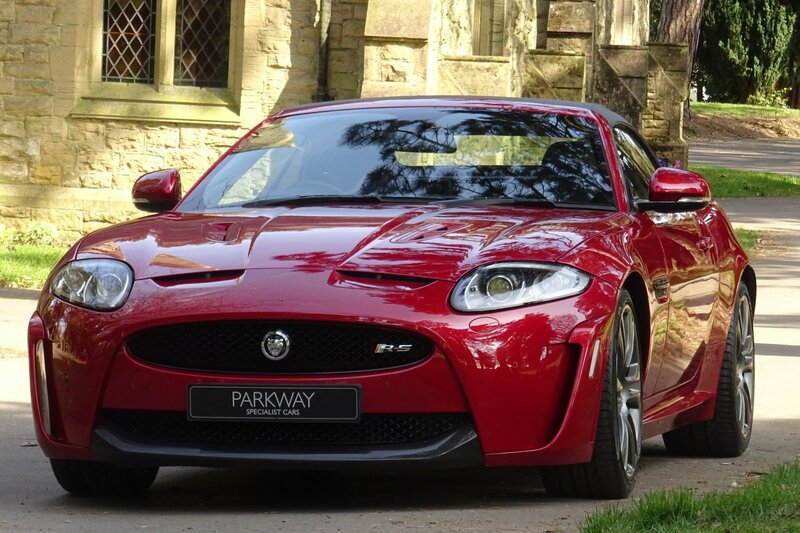 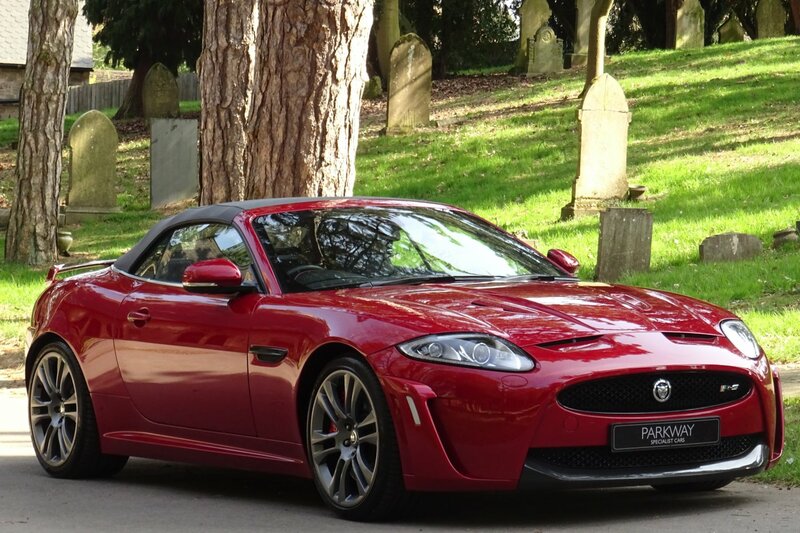 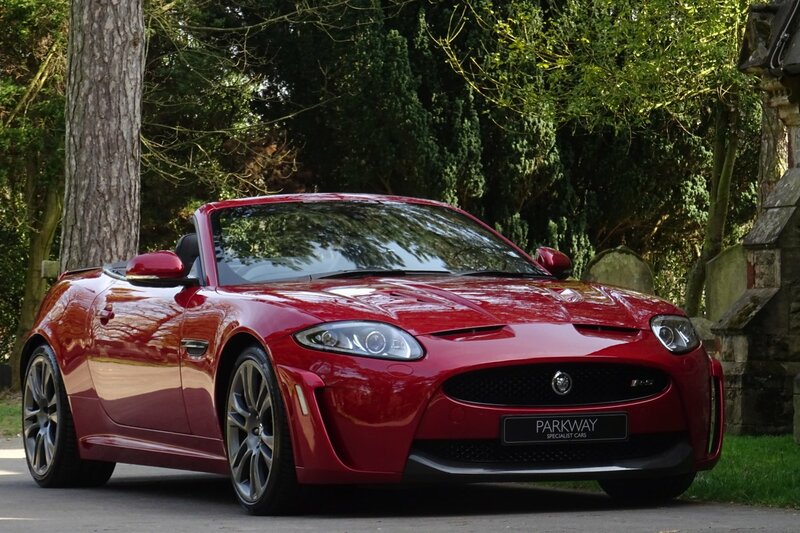 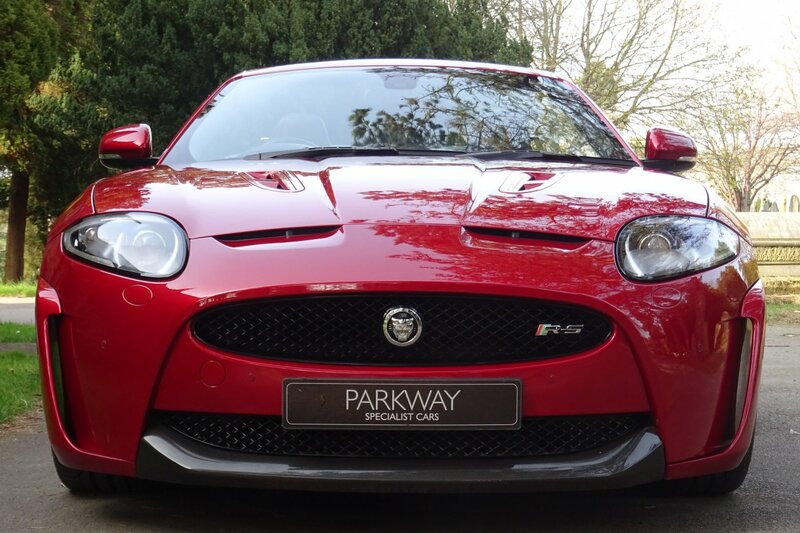 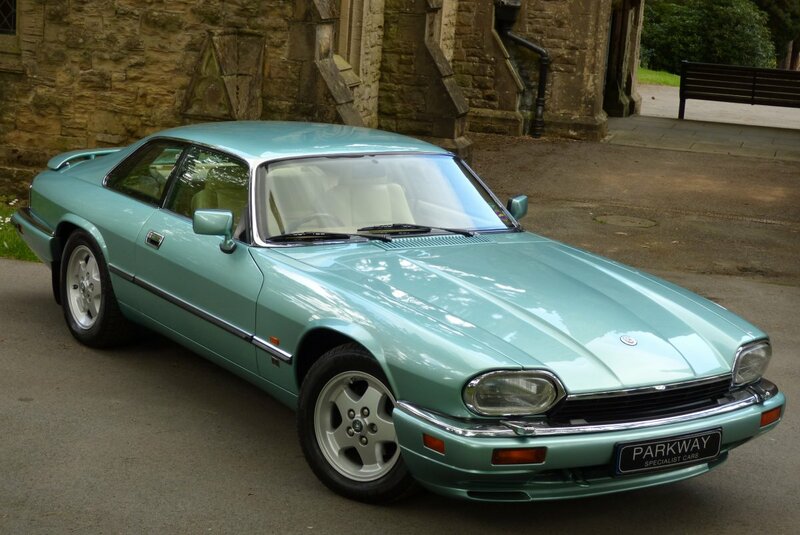 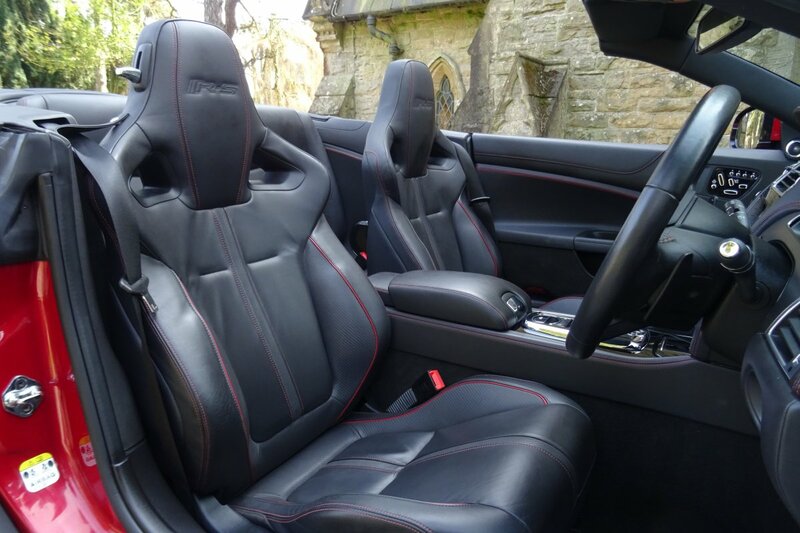 Offered for sale with the original service book, Jaguar factory build card, owners book pack and the XK owners club XKR-S write up this is a stunning example of an extremely rare car. 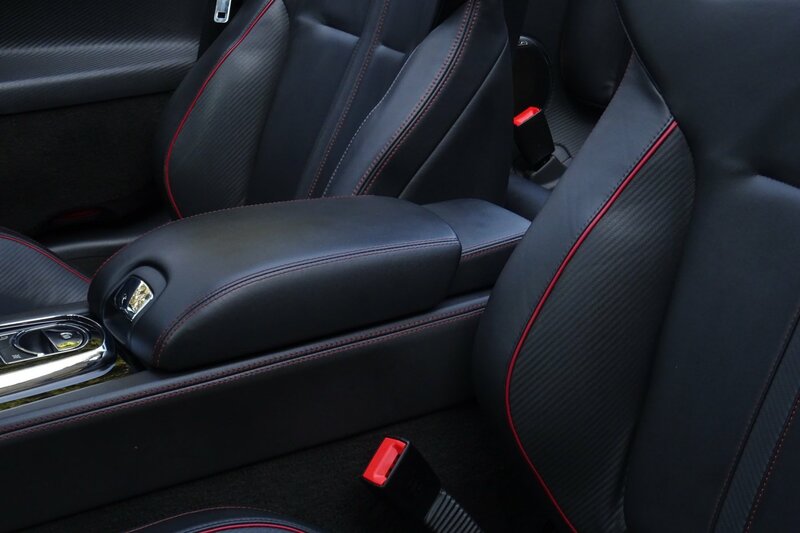 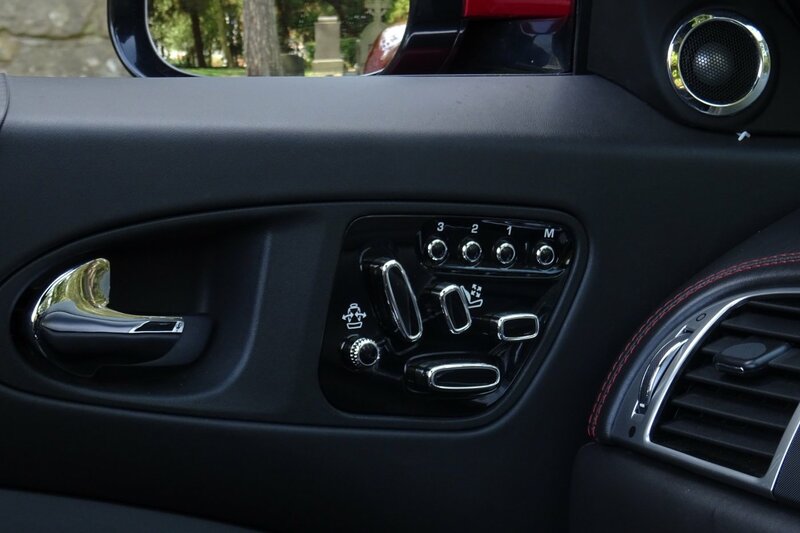 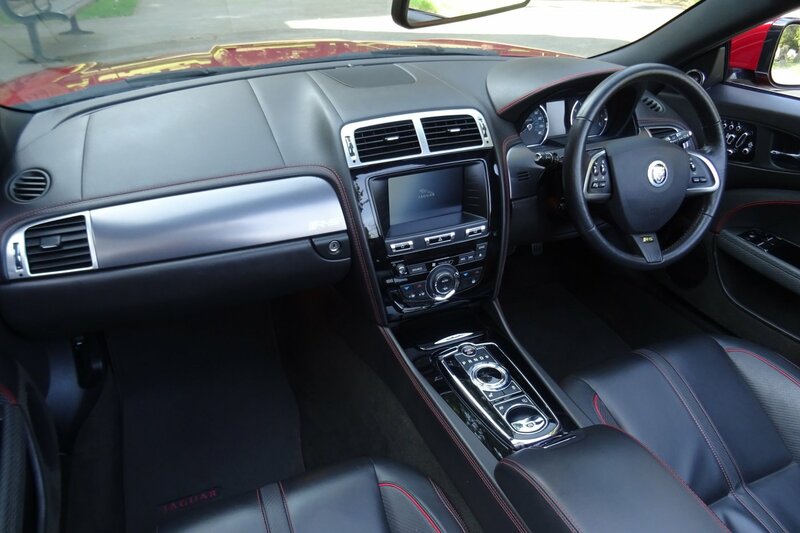 The interior of the Jaguar XKR-S offers that same excitement that the exterior does, matching the drive to offer a pure, exhilarating experience for both driver and passengers. 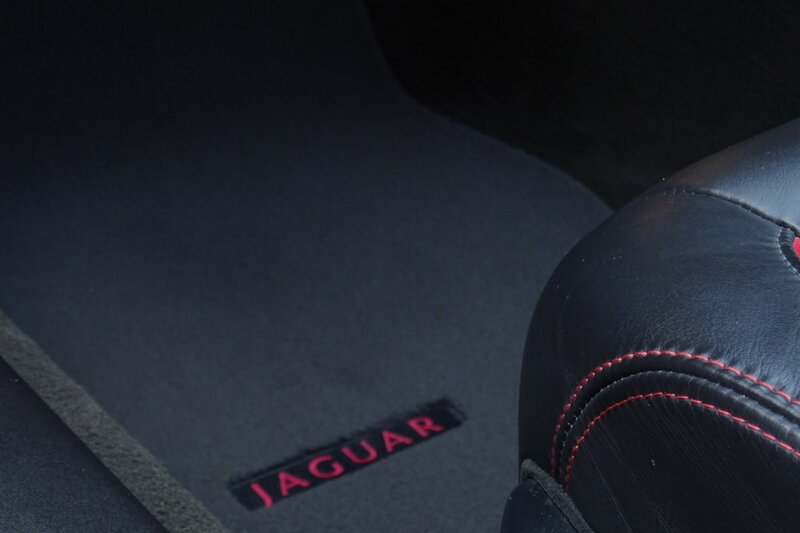 Opted from factory with the charcoal black performance wingback seats with red stitch detail and carbon look leather detailing, black leather dash, carbon look leather door card inserts, charcoal black carpets with Jaguar mats, black leather centre armrest and drivers tunnel that surround the centre console. 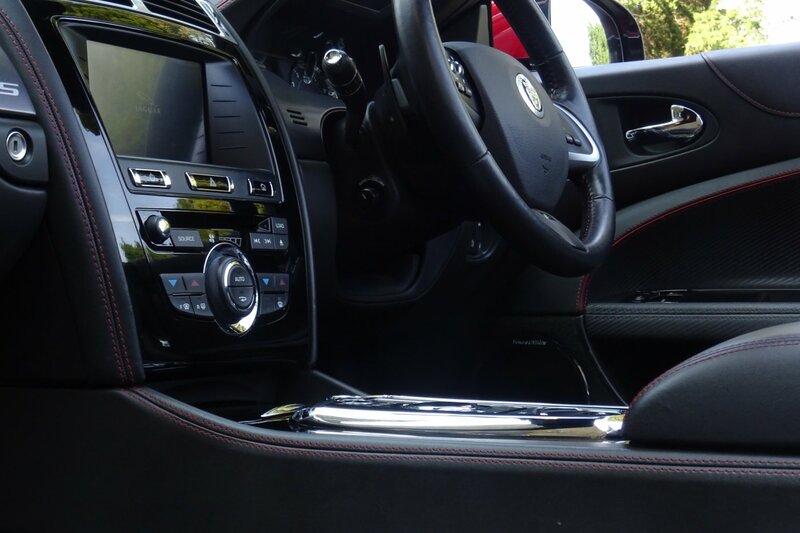 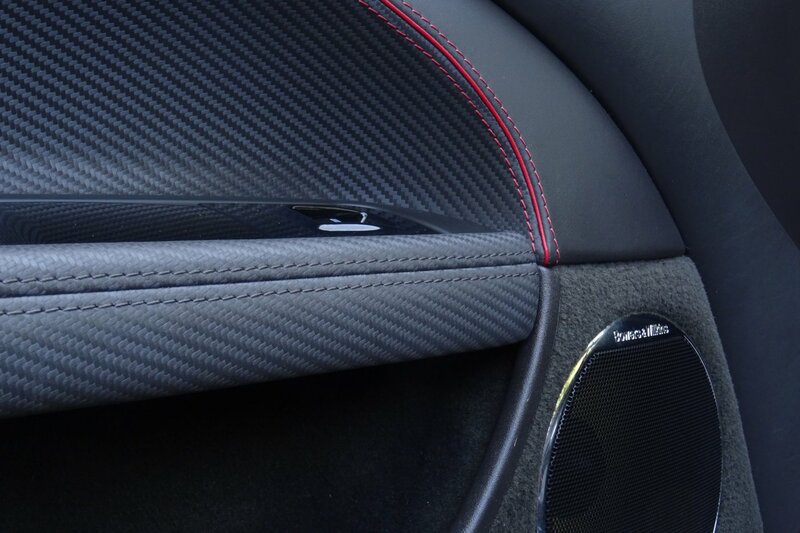 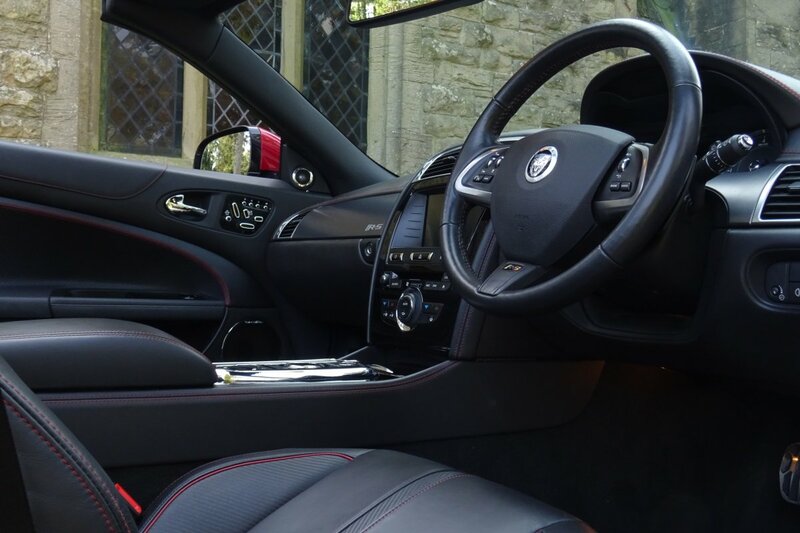 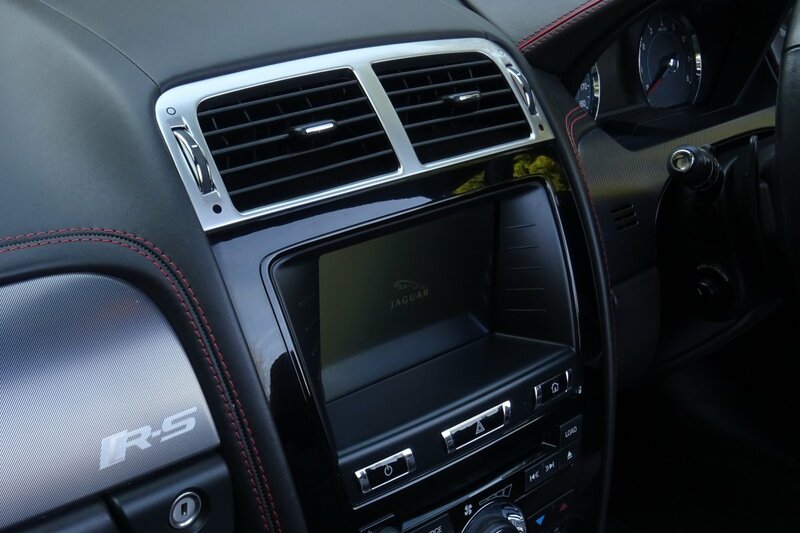 The interior space is finished off in fantastic fashion by the piano black centre console and the XKR-S exclusive dashboard insert. 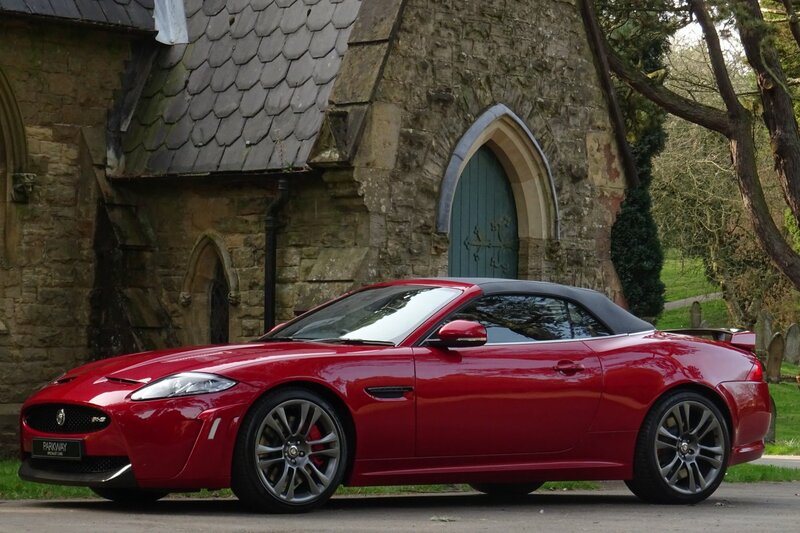 The styling of the XKR-S is dramatic in every sense, despite being designed to ensure the greatest possible performance Jaguar has done its usual trick and made a truly stunning X150. 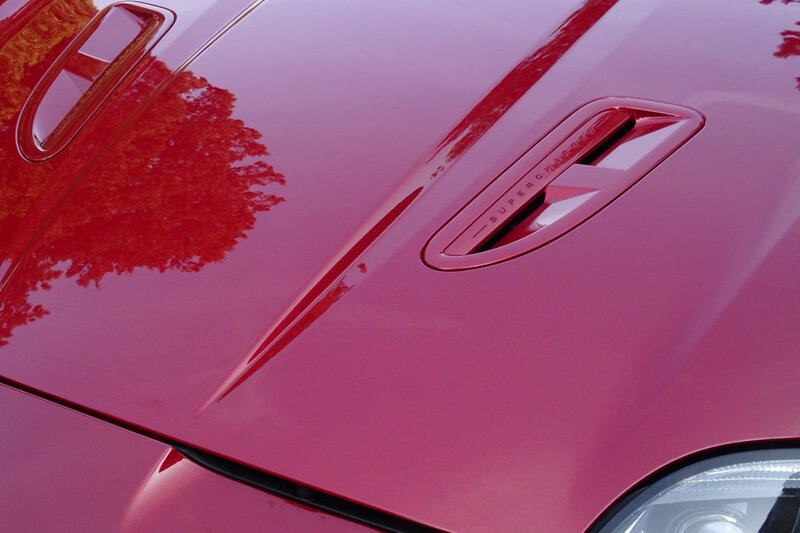 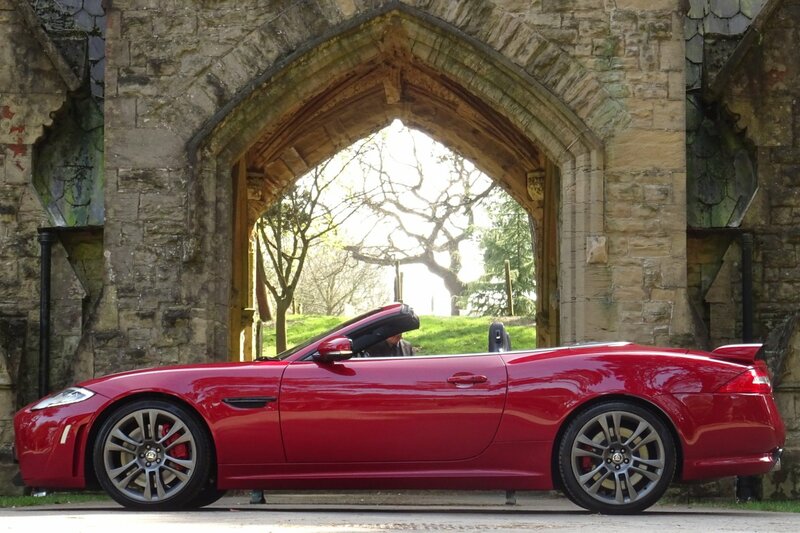 Created through several hours of wind tunnel testing the flagship XKR undertook several exterior modifications to ensure it was the ultimate car. 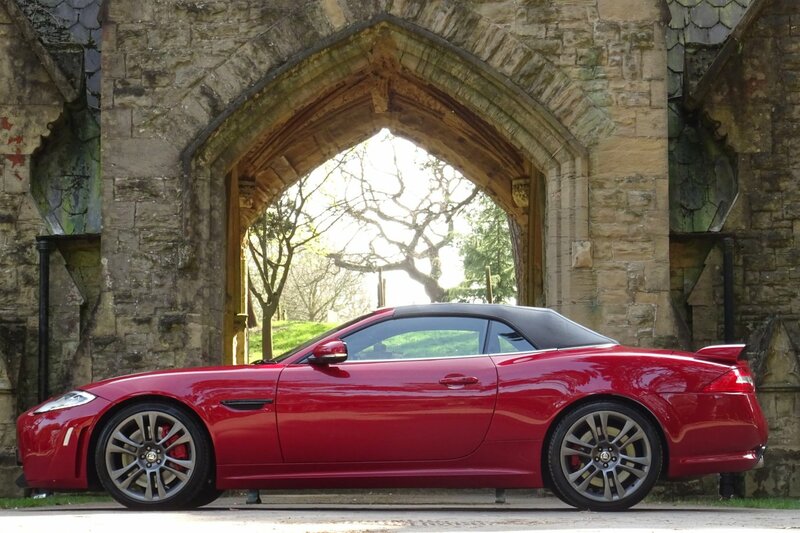 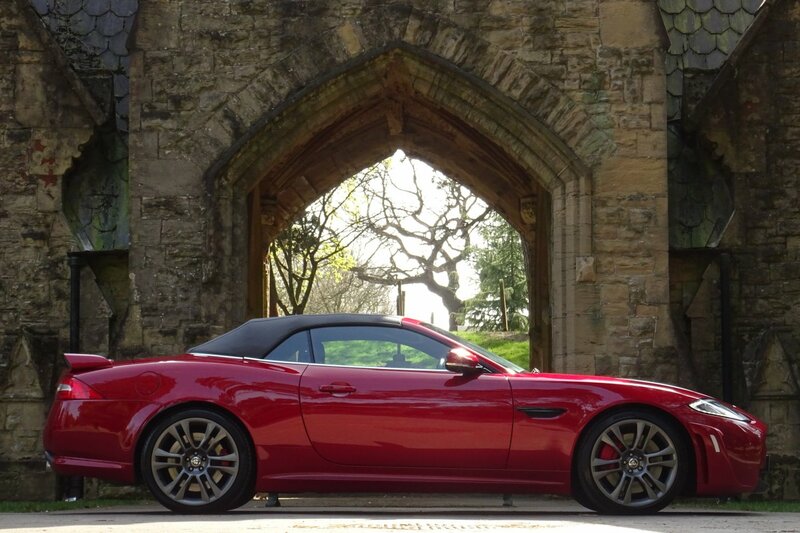 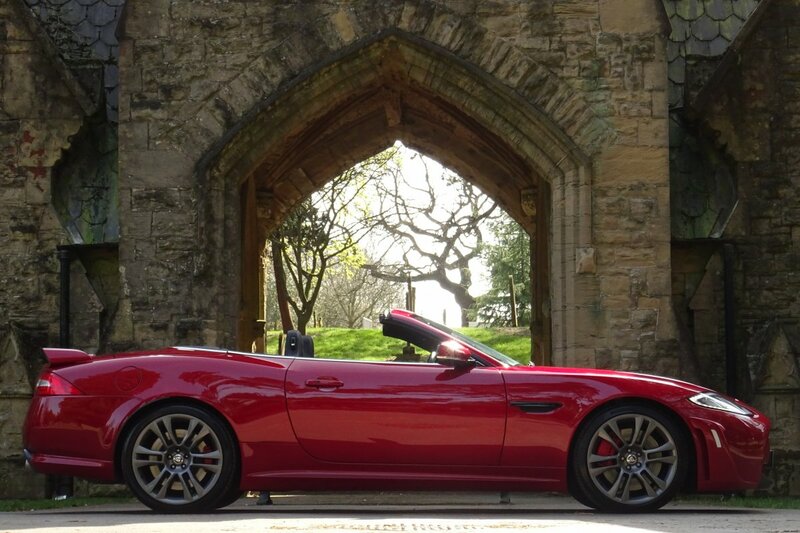 Presented in Jaguar's famous Italian Racing Red with the 20" Dark Grey Forged Vulcan Alloys and optional grey roof the XKR-S looks truly staggering. 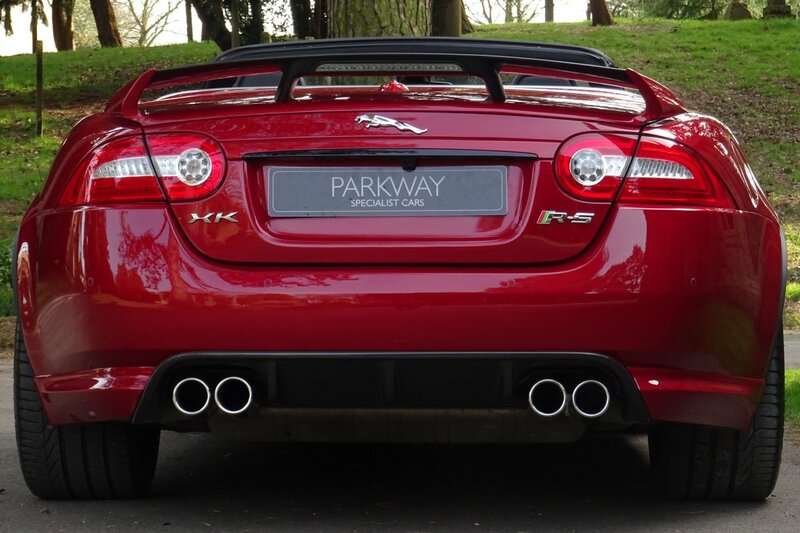 Further exterior details come in the form of the XKR-S exclusive fixed rear spoiler with carbon centre piece, the colour coded oval air intakes, lower front splitter which was all designed to created greater high speed stability. 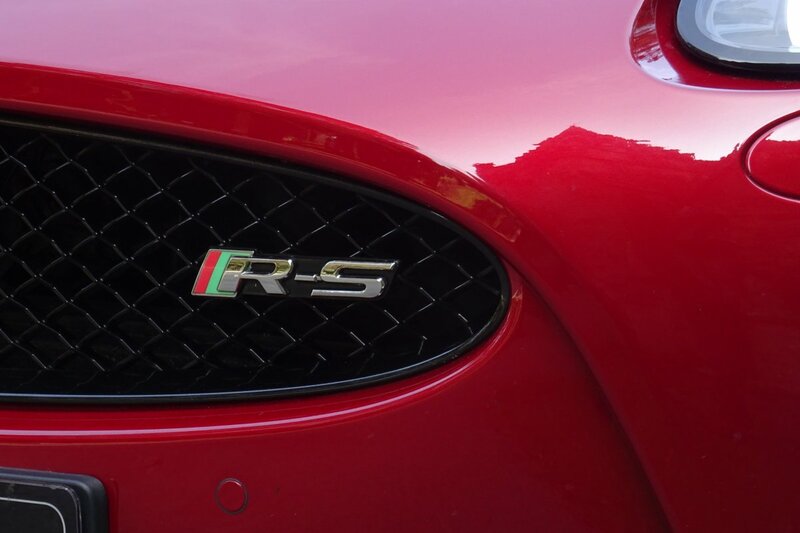 The XKR-S also has wider sills than the standard XKR and also comes with the colour coded bonnet vents and that quad exhaust at the rear that makes such a great soundtrack.